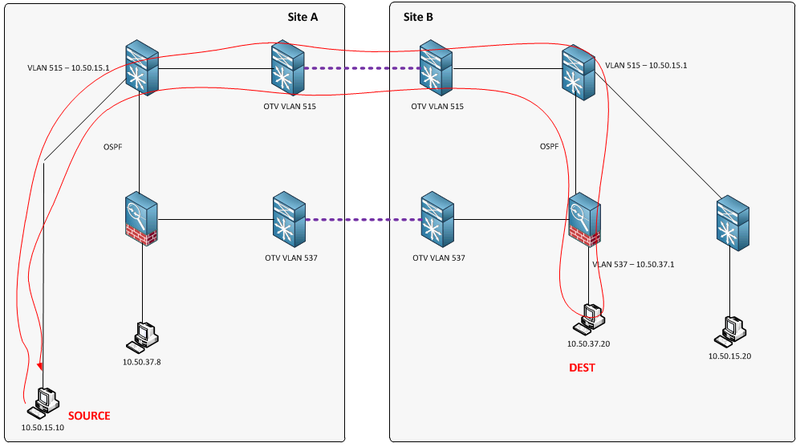 The Blue Layer 3 gateways are on the core devices in each network (10.50.15.0/24 in this example). The Red Layer 3 gateways are on firewalls at each site (10.50.37.0/24 in this example). 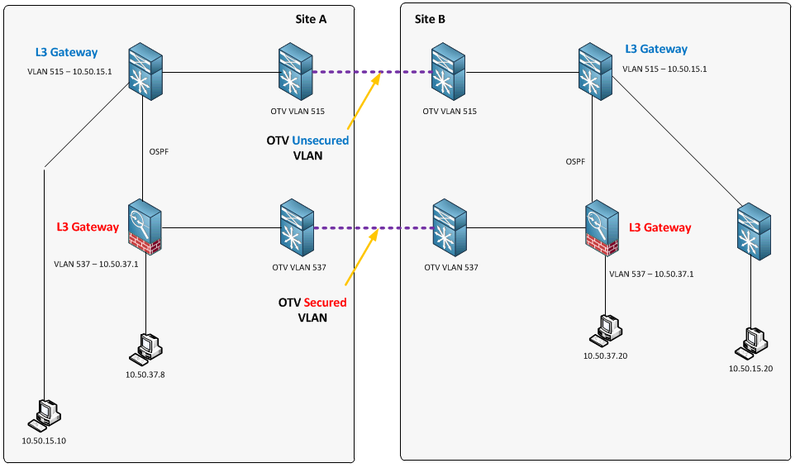 OTV works beautifully for unsecured (non-firewalled) networks. However, we quickly discovered an issue with the firewall-secured networks. Local firewall receives a SYNACK, checks its state table, but never received the SYN. Packet is dropped. The reason this is not an issue with unsecured networks is due to the fact that no firewalls are in place, therefore no stateful inspection, and successful gateway localization at each site. We immediately collaborated to come up with some alternative solutions to solve this problem. 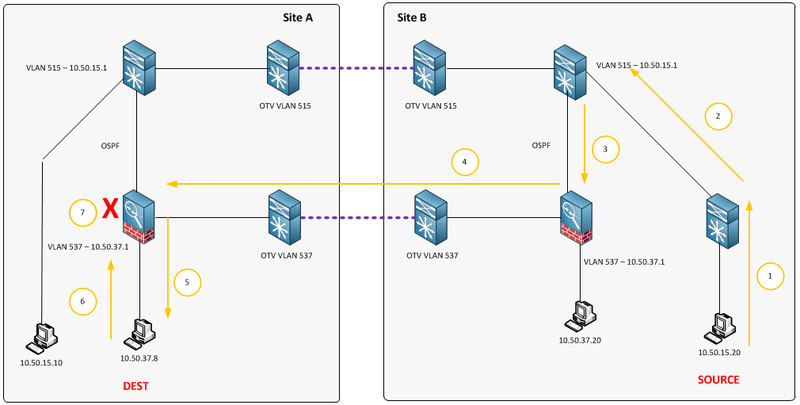 Configure a default gateway in only 1 site. Doubles latency and link utilization for particular traffic flows due to traffic tromboning. This could have a detrimental effect on application performance between remote sites. We ran some performance tests to determine the impact, and as expected, latency was doubled (sometimes tripled) for particular traffic flows. This also affects bandwidth utilization – recipe for disaster. On the ASAs we could use TCP state bypass or asr groups to essentially “ignore” the asymmetric routing issue by bypassing the state table. 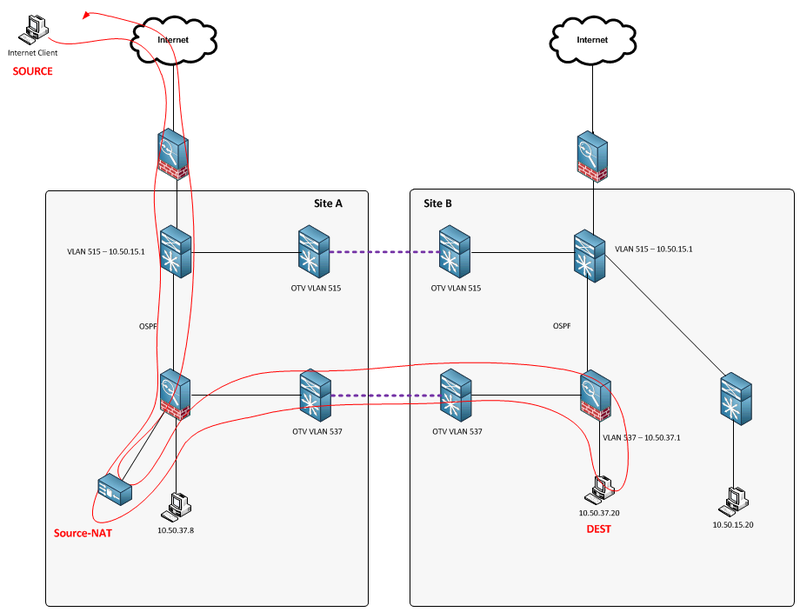 In the examples below, I added a third network (10.50.48.0/24), which is also firewall secured. 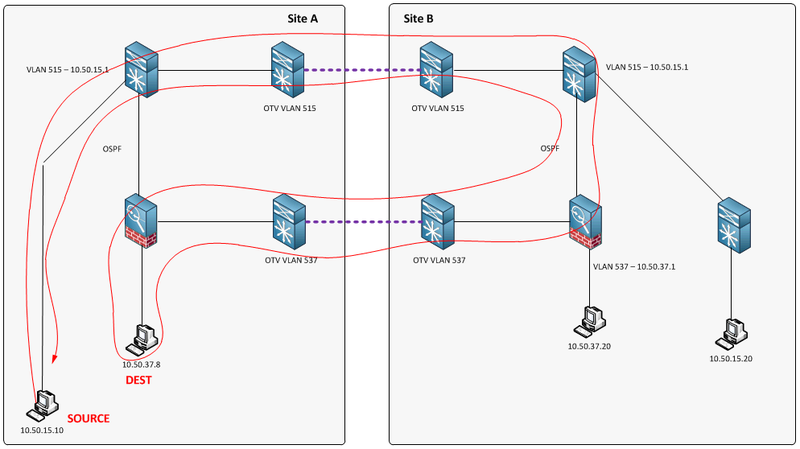 The purpose of this additional network is to show flow between two separate, secured, OTV’d networks. This is actually a pretty sweet solution if your environment is capable of it (recommended by our Cisco SE). Clustering ASAs eliminates the asymmetric routing issue due to the fact that all firewalls in the cluster share the state table. 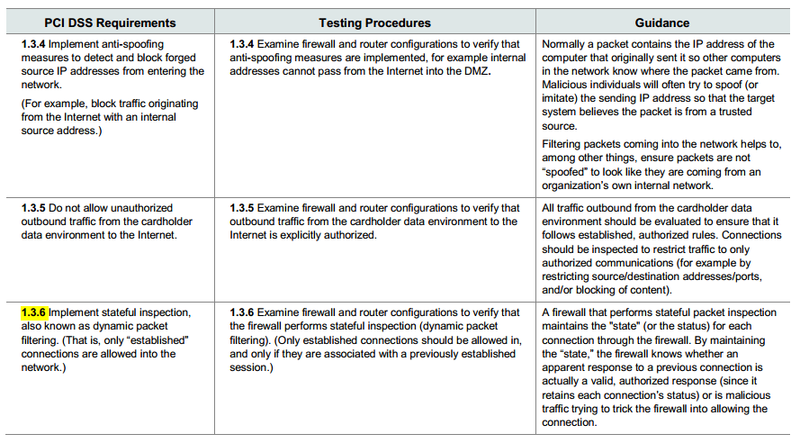 All firewalls are capable of forwarding all traffic flows. One large caveat with this design is the geographic limitation. 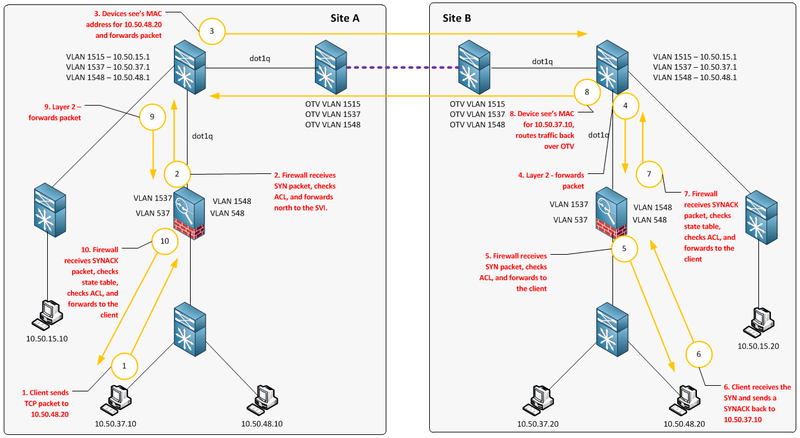 Unless your Data Centers are less than 100km away, and latency between your sites is less than 10ms, this design is not currently supported by Cisco. So, if you’re Data Centers are connected via 1Gbps across multiple states, this may not be a possible solution for you. Pingback: Onward to CCNP: Data Center!! Did you try tu use LISP Multihop extension to get it working? Seems to be the best solution in your use case, because you don’t need to configure the same security policies on the two sites firewalls. Thank you for the comment. I considered LISP, but given that all the platforms involved in the communications did not support LISP, and the fact that no Cisco customer at the time was running this in production, I decided to advise against it. I do agree with you, however, that LISP is the way to go as long as it fits in your network. Thanks!